Hadas Mizrahi tearfully asks the State to reject petition protesting punishment for her husband’s murderer. 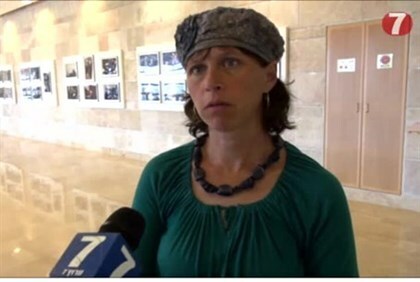 Hadas Mizrahi, the widow of slain Commander Baruch Mizrahi hy”d, defended the State of Israel’s decision to demolish the home of her husband’s murderer at a Supreme Court hearing Monday afternoon. Mizrahi warned that preventing the demolition from going through would be a missed opportunity to deter future terrorists. Mizrahi later explained her speech to Arutz Sheva. Meir Indor of the Almagor terror victims organization agreed. Earlier this week, a petition was filed against the home demolition in the High Court of Justice; the Court rejected the petition “in light of the current security situation” and cited concerns that terrorist Ziyad Awad—who also carried out the attack with his son’s help—will kill again. The state also noted that the murder was premeditated, with several “practice sessions,” and that the building had—in any case—been slated for demolition “for years” before the murder. Mizrahi was driving to Kiryat Arba for a Passover seder meal earlier this year, with his pregnant wife and three of his children, when the terrorist opened fire on the family car. He served as head of the Technology Division in the Sigint Unit, part of the Intelligence Brigade in the Investigations and Intelligence Branch of the police.